Note though: I don’t recommend customizing and using your own Forms version, as forking leads to quickly getting behind the releases, but it’s useful for testing any PRs you might be working on. 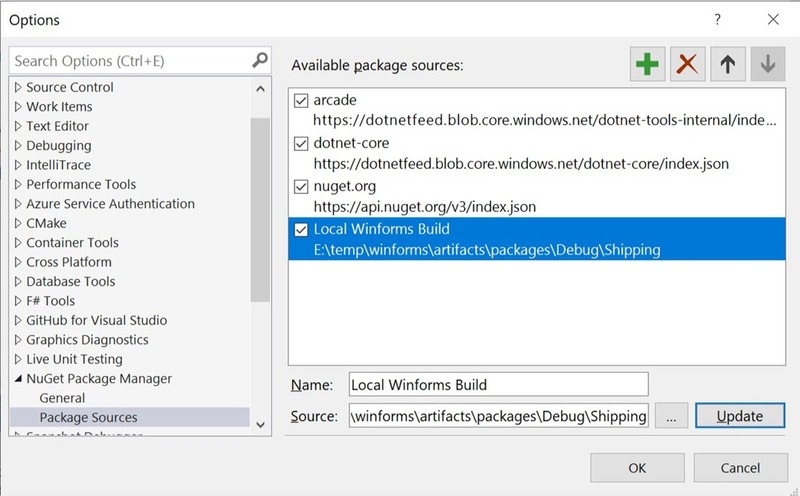 First install the latest .NET Core 3.0 Preview SDK. 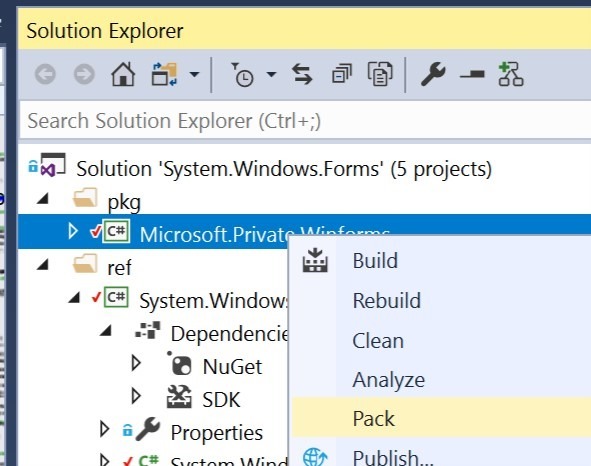 If you’re using VS2019 Preview, you’re now good to go. 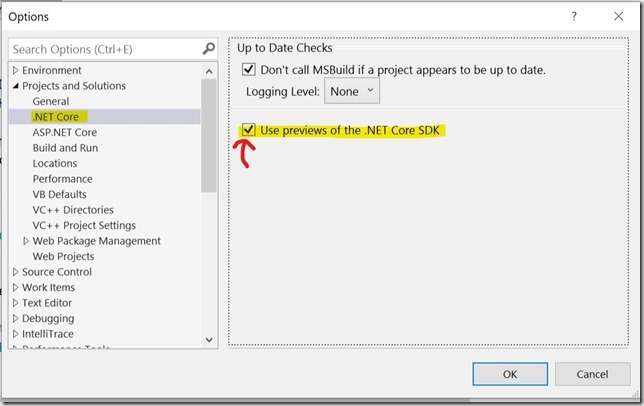 However if you’re using VS2017, then after installation completes, open up Visual Studio settings, and make sure the “Use previews of .NET Core SDK” under “Projects and Solutions –> .NET Core” is turned on. 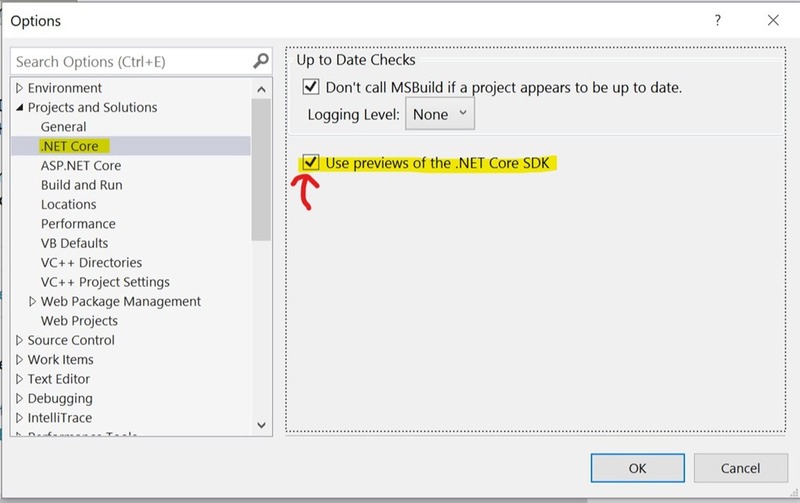 If you don’t do this, you’ll start getting build errors when building .NET Core 3.0 preview apps saying “The current .NET SDK does not support targeting .NET Core 3.0. Either target .NET Core 2.1 or lower, or use a version of the .NET SDK that supports .NET Core 3.0”. The first step is to clone the repo. Use your favorite git tool or clone from commandline using “git clone https://github.com/dotnet/winforms” . Alternatively just download the zip from github and unzip it. However if you add any new classes or members, you’ll also have to go add the same members to the System.Windows.Forms.Ref project in the ‘System.Windows.Forms.cs’. These are just stubs and you can follow the pattern of the other classes to see how it’s done. If you don’t so this, you won’t be able to use the new APIs you’ve added, as this project generates the reference assembly you compile against (while the main one is the one you run against). Once you’re happy with your custom Windows Forms solution, right-click the “Microsoft.Private.Winforms” project and select “Pack”. Note: If you just compiled everything, this doesn’t do anything – the pack operation only seem to work if there’s also something new to compile (VS bug? ), so usually I just quickly touch a file and undo the change to trigger a new compilation. You can also build and pack from commandline. 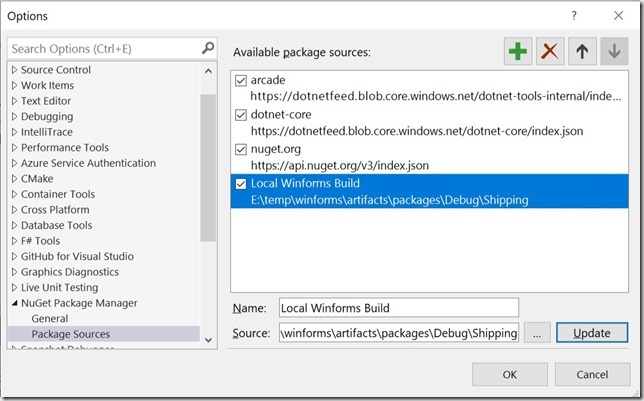 Browse to the root of the repo, and enter “build –pack” to generate the nuget package with your custom build. 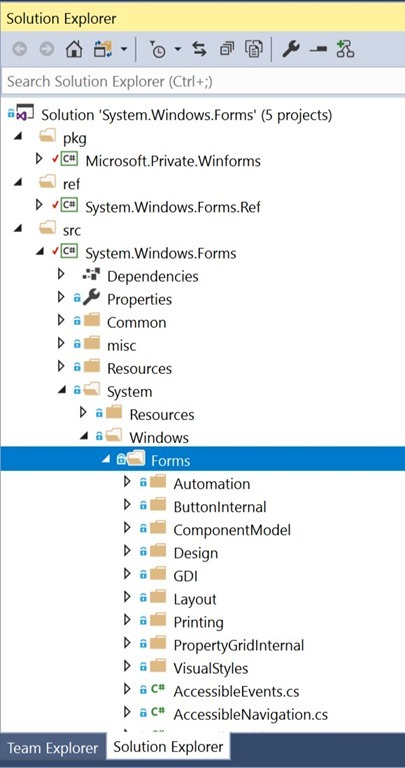 Also I encourage you to read the Building Guidelines for more information regarding building Windows Forms. You should see something like this in the output, including a path to the .nupkg file generated. Make note of this path, as we’ll need it later. Note: An alternative to packing things up as a nuget package, is to simply use this repo a submodule. In that case all you’d need to do is add the main System.Windows.Forms project to your project, and add a project reference. Now to use this new build: Open a command prompt and go to a new empty folder. Then enter “dotnet new winforms”. This would generate a new winforms project, with a .csproj file that you can open in Visual Studio. And voila! You’re now set up to build a WinForms app that’s running on your very own WinForms version. Word of caution with this nuget package: If you go back and make more changes to your WinForms project and create a new nuget package, make sure you clear out the package from your NuGet cache, or you won’t see any of the changes, as the newly generated nuget package will have the same ID and Version, and the cache would just kick in and pull from there instead. But if you’re using a fork, you can also add NerdBank.GitVersioning to the project to get auto versions which will update the package ID with each commit. The alternative is to use the submodule / project reference approach mentioned above which avoids the caching issue. Thank you to Oren Novotny for reviewing this blogpost prior to publishing (and for generally being awesome to the entire .NET community). I’ve been playing a lot of the Roslyn API lately, and recently got the idea to use it for analyzing the source-code of an API and report what the API looks like. 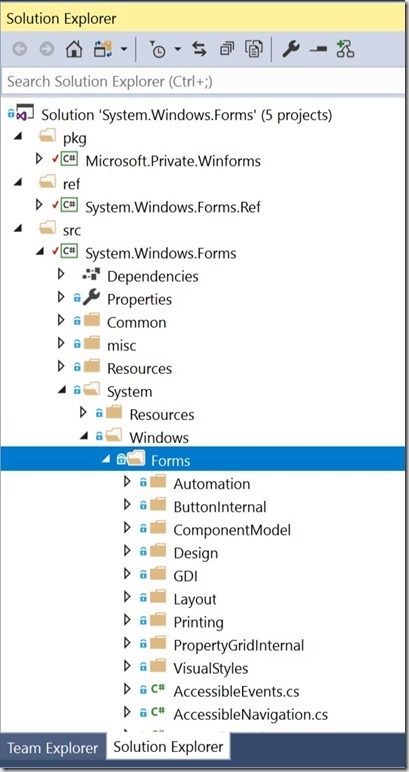 When I do API reivews, I often like to look at an Object Model Diagram, and I have often used Visual Studio for this by creating a new Object Model Diagram and dragging my class files onto it. It’s somewhat of a great experience, but it has several limitations and bugs that makes it tedious or misleading. So I figured why not try and use Roslyn to generate these diagram? After all it’s basically just a list of members in a box. So I set out to create an HTML page with all the objects in a set of C# files. Note that you can hover on classes, members and parameters and you’ll get the <summary/> API Reference description for them. Known types that are in the object model are also clickable for quickly navigating the view. I’ve already started using this tool in my day-to-day work, as well as some of the online community work, like the UWP Community Toolkit. What I’ve found is that inconsistencies and poor naming really stands out like daggers in your eyes when looking at an object model, compared to scanning over 100s or 1000s lines of code. Internal code is easy to fix later. But if you get the public object model wrong, you’re stuck between introducing breaking changes, or living with the poor API design forever. What if you want to just create an object model when you build? Well there’s a NuGet for that. Add a NuGet reference to “dotMorten.OMDGenerator”, and each time you build your C# Class Library, an HTML file is also generated. It will slow your build down slightly. so you might not want it enabled all the time, but it’s an easy way to quickly generate an object model. Note though that this is limited to generating an OMD for a single project, and not a combined OMD for all . Another thing I very often do is looking pull requests, and when you have 100s of objects, it’s not really useful to be looking at the entire object model. Instead you want to focus on what changed, and if it introduced any breaking changes. I basically needed a diffing-tool. Note that this will show breaking changes in .NET Core: But feat not: Just because it was in the v2.0.0 branch, there were things that weren’t actually released, and has been changed since. Another issue is the source structure has changed and some base types where not there before. This caused some of the types to look as if they are changed. The point is that the analysis is only as good as the source code it has access to. Another example of this you’ll see is if a class implements an interface, but doesn’t have a base class, and that interface isn’t part of the source code, there’s no way for Roslyn to know if it’s an interface or a base-class, and it’ll end up listing the interface as a base class. Also there are probably still some bugs left. Not only will it show things that might not be a breaking change as a breaking change – it might also overlook changes, so use it as a tool to help you, but not as the end-all-be-all public API review tool. I take pull-requests too! If you see a bug, feel free to submit a PR (or at the very least submit an issue). Git-hook that automatically injects an object model of changes (if there’s changes), when a user submits a pull request. Support for specifying two branches in a local repo, instead of having to have two separate source folders. I’ve lately been working on getting our automated builds complete faster. Faster builds means shorter times between commits and new fresh builds, gated check-ins can be evaluated faster etc etc. In my specific case, I need to build and link A LOT of native C++ code for both x86, x64 and ARM, and the full process takes over 1.5 hours on my speedy desktop, and over 2 hours on the build server! As part of this work, wanted the build server to only focus on the builds that were important for the product, but still have a solution that builds unit tests, test project etc for the devs to use day to day. Also because we build both AnyCPU .NET libraries and architecture-specific apps and native libraries, the build server would while building each architechture also build the AnyCPU builds over and over, and the build server also didn’t really need to build the unit tests as part of the production build either. The thing is, several of the compilation process is single-threaded, but these days we all have 4, 8, 16 etc cores to play with. Why not put them all to good use and speed up the build? Especially linking a lot of native C++ static libraries are mostly single threaded and can easily take a very long time. Why not use a CPU for each architecture? Build in parallel output below. Note hos the output is exactly the same, but now each architecture output more or less outputs in the same order and completes simultaneously. But much more importantly, notice the 40% reduction in build time! And this is for a completely blank UWP app template. This is no small reduction. And remember if you have lots of native code to link, you can see even bigger saves. In my specific case, I have A LOT of static libraries to link, which takes between 22 and 35mins to just link depending on architecture. The entire build takes about 90mins to complete. When building in parallel, that’s “only” 38 minutes. This is HUGE for pushing out fresh setups to test, or enabling gated check-ins. The interesting bit here is that msbuild doesn’t actually parallelize this build (though it probably should) as clearly visible in the output, and you get the same “slow” build time. As a follow-up to my recent OpenZWave blogpost ( /post/2017/01/20/Using-OpenZWave-in-UWP-apps ), a few things has happened since. To successfully support UWP and .NET, I wanted to achieve as close code compatibility as possible, and for maintainability also reuse as much C++ code as possible (both libraries are written in C++ – C++/CX for UWP and C++/CLI for .NET). The APIs for the two binaries should however be completely identical and the code you write against them the same. This meant a lot of refactoring, and breaking the original .NET a little. At the same time, I did a full API review, and cleaned it up to better follow the .NET naming guidelines. The overall API design hasn’t changed too much, and moving from the older .NET API shouldn’t be too much work (the original WinForms sample app was ported over with relatively little effort and is available in the repo as a reference as well). Or try out the sample applications included in the repository. So go grab the nuget package today and start Z-Waving! Note: If you are using IoTCore, beware that Microsoft pre-installs an OpenZWave to AllJoyn bridge. This bridge will grab your Serial Port, so make sure you disable this app prior to using the library. Second: The built in AllJoyn-ZWave service by Microsoft only supports the older Gen2 AeoTec adapter, whereas this library also works great with the Gen5 models. In my recent IoTivity hacking, I wanted to create a bridge between ZWave and IoTivity, and run it as a StartUp task on my Raspberry. Something similar already exists in Windows IoT Core, as a bridge between ZWave and AllJoyn. Actually all you have to do is get a Generation 2 Aeotec ZWave ZStick, plug it into your device running IoT COre and you got yourself a ZWave-to-AllJoyn bridge. Unfortunately those aren’t being sold any longer, only the Generation 5, which isn’t compatible with the bridge. AllJoyn isn’t doing too well either. Anyway, back to IoTivity: To build a bridge, I needed a ZWave library that supports UWP. After all, most of my devices are ZWave devices. I have my SmartThings hub as a primary controller, but you can add any number of ZWave USB Sticks as secondary controllers to the ZWave network. So I can continue to rely on SmartThings (for now), while I start hacking with the USB controller against the same devices. Luckily Donald Hanson has an awesome pull-request for OpenZWave that adds a native UWP wrapper around OpenZWave, based on the .NET CLI wrapper. However the OpenZWave people were a little reluctant to merge it, as they already have a hard time maintaining the .NET CLI one, and suggested someone taking it over. I offered to do this but haven’t heard anything back from them. So while waiting, I just started a new repo to get going with Donalds blessing. I’ve spent a lot of time cleaning up the code, as there was a lot of odd patterns in the old .NET library that created an odd .NET API to work with (for example there was Get* methods instead of properties, delegates instead of events, static types that aren’t static etc). I’m also working on bringing the .NET and WinRT core in sync, so the two could share the same source-code. I’m not there yet, but it is getting close. If you have some C++ experience, I could really use some help with the abstraction bits to make this simpler. Bottom-line is I now have a functioning wrapper for OpenZWave that can be used for .NET and UWP, and it works with the new Gen5 ZStick! (and many others) There are many breaking changes though, so I don’t know if OpenZWave wants to bring this into their fold. If not, I’ll keep hacking away at it myself. I do expect to continue making a lot of breaking changes to simplify its use and make it more intuitive. Due to the nature of ZWave devices, you can’t always rely on an instant response from a device when it is trying to save battery, so it could be several minutes before you get a response (or never), so a simple async/await model doesn’t work that well. The rest is in the Notification handler. Every time a node is found, changed, remove etc. an event is reported here, including responses to commands you send. Nodes are identified by the HomeID (one per usb controller), and by the NodeID. You use these two values to uniquely identify a node on your network, and can then oerform operations like changing properties via the ZWManager instance. There’s a generic sample app you can use to find, interrogate and interact with the devices, or just learn from. Longer-term I’d like to build a simpler API on top of this to work with the devices. The Main ViewModel in the sample-app is in a way the beginnings of this. And by all means, submit some pull requests! Since I’m a .NET developer who can’t be bothered with spending too much time in C++, what am I to do if I want to use the IoTivity library to expose and interact with devices on the OCF protocols? The SDKs provided are either C++, C, Java (Android) and Object-C (iOS). .NET is sorely missing (hint hint OCF!). Well the key here is the C SDK. 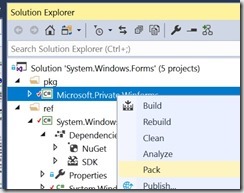 It provides the necessary export of methods to import them into C# using p/invoke. Even better this approach works in .NET, UWP, but even Xamarin Android, and Xamarin iOS (and probably more). So why not create a set of C# classes in a .NET Standard library that imports the methods, to call into the native library? This is however a work in progress, but it already allows you to create, discover and interact with devices over the IoTivity protocol. Compared to the AllJoyn APIs, the IoTivity API is A LOT simpler. In fact you can create a device in a single line of code. Look at the sample apps for examples how to create devices to discover and respond to requests from clients. Note 1: Currently the SDK is building off a fork of mine that has a set of bug-fixes for IoTivity, rather than using the official builds. All of these bugs are logged and waiting to be fixed, but the IoTivity maintainers have been pretty responsive to this, and one has already been fixed recently. Note 2: Xamarin doesn’t work at this point. I have not been able to compile the native libraries for these platforms. However it should “just work” once that’s done. If you’re interested and have experience building native iOS and Android libraries, I would love a hand with it. Yes yes yes, I know… this blog has been pretty quiet lately. Sorry, I’m trying to fix this. I’ve been busy with releasing a very large awesome .NET product, spending some time on the UWP Community Toolkit, and hacking away at various IoT projects, and most importantly spending time with my family. My IoT-related GitHub repos are getting a little out of hand, but I’m having a lot of fun creating all the building blocks for a smart-home. My ultimate goal is to build a system that can interact with any protocol, and is resilient against internet-outages (your light switch should still work even if the internet is down – yes I’m looking at you SmartThings!). Regarding my IoT projects, I’d like to start writing down my progress, make some notes, ramblings etc. It’s a great way to get feedback, share your work, gather your own thoughts, and having to explain something helps myself really understanding the topic etc. So I’d like to start my blog back up with various IoT topics. For those who have been following me on twitter knows I’ve been hacking away at AllJoyn, ZigBee, ZWave, IoTivity etc. I’m going to start writing some blogposts gathering my experiences, thoughts etc. While this blog might have been a little quiet, I have actually been writing some articles on Hackster.io, so I’ll start with a few links to those, before diving into a series of IoT related blogposts.